This is an updated version of a previous essay. You might find it useful when reaching out to newbies. "I don't believe that the World Trade Center could have been destroyed by controlled demolition . . . how could they have possibly planted bombs without anyone seeing them?" There was a power down in the Twin Towers on the weekend before 9/11, security cameras were shut down, and many workers ran around busily doing things unobserved. And -- as an interesting coincidence -- a Bush-linked company ran security at the trade centers, thus giving it free reign to the buildings. These are just a few of the known, public examples of opportunities to plant bombs. There were undoubtedly many additional opportunities available to skilled operatives." GW, you know I have been thinking about this a lot. Everyone focuses on Securacom and that power down, but I have a hard time thinking that they could get those monsters ready for complete demo in a few days. This guy is chasing down the WKJO info in detail, and I think they key might be in the actual tenants with CIA ties, like Marsh. They would have all the time in the world to at least prep their floors or whatever. Al C. (not verified) on Sat, 07/15/2006 - 10:19am. Just a minute. Correct me if I'm talking nonsense, but - did they need to plant devices all over the building? Wouldn't a couple of suitcase bombs of sufficient power - and we know that tactical nuclear devices exist which could fit in a suitcase - planted in the basement of each tower be enough? The shockwave would run up the elevator shafts, knocking out the central core like an apple, and the floors would then implode onto the empty hole thus created. Andrew Lowe Watson (not verified) on Sat, 07/15/2006 - 10:27am. GeorgeWashington (not verified) on Sat, 07/15/2006 - 10:27am. Andrew: Regardless of what actually happened, most people won't believe controlled demolition unless they believe there was an opportunity to plant bombs. The more exotic the weaponry, the less likely many people are to believe it. If we can prove it (for example, very high geiger counter readings), okay. But in the absence of that type of smoking gun, I believe it is more effective to look at more low-tech explosives. GeorgeWashington (not verified) on Sat, 07/15/2006 - 10:29am. aka: [MaxResolution] for all further e'searches. TS Gordon (not verified) on Sat, 07/15/2006 - 10:34am. Andrew, I thought somebody debunked that theory with radiation measurements or something similar. I think hospitals would have picked that up in two seconds. This is the only thing I could find on "tactical nukes" other than some of that wild speculation blimp and others throw around here. Al C. (not verified) on Sat, 07/15/2006 - 10:36am. Dr. Bowman is going to be on Mike Malloy tonight. FYI. Jon Gold (not verified) on Sat, 07/15/2006 - 10:43am. So far, there hasn't been any "smoking gun" evidence of nukes. There are cancer clusters which some have argued are reminiscient of nuclear fallout, but not too much else. If anyone has a smoking gun geiger counter reading or something, let me know. GeorgeWashington (not verified) on Sat, 07/15/2006 - 10:44am. How does one identify a 'bomb- sniffing dog'?... so what that the dogs were removed from the WTC 5 days before...my guess; they were not bomb-sniffing dogs to begin with... think about it. These companies focus on "access control" and as security specialist Wayne Black says, "When you have a security contract, you know the inner workings of everything." Stratesec, a now-defunct company that had security contracts at the World Trade Center and Dulles International Airport, should be investigated, among others, because of the strange coincidence that President BushÂ’s brother, Marvin P. Bush, and his cousin, Wirt D. Walker III, were principals in the company, with Walker acting as CEO from 1999 until January 2002 and Marvin reportedly in New York on 9/11. At least one report claims that a "power down" condition prevailed on September 8Â–9 (pdf, p. 45) at WTC to complete a "cabling upgrade," presenting an opportunity to plant explosives with low risk of detection. justin howard (not verified) on Sat, 07/15/2006 - 10:45am. How many people listen to Mike Malloy? GeorgeWashington (not verified) on Sat, 07/15/2006 - 10:45am. A lot. As far as I know... the choir for the most part. He's popular among New Yorkers I think. Jon Gold (not verified) on Sat, 07/15/2006 - 10:49am. No discernable radiatiion beyond the normal inner city levels when I tested at the PATH staton's lowest level (the platform) last month. __lakezoarian__ (not verified) on Sat, 07/15/2006 - 10:50am. Jon Gold (not verified) on Sat, 07/15/2006 - 10:50am. "50 year study says conservatives 'followers'"
jfal (not verified) on Sat, 07/15/2006 - 11:00am. GW - it seems outlandish, unlikely, I know. My head says conventional weapons. but you know you get these gut feelings and i have one that tells me it wasn't conventional. Anyway I won't post any more on that for now. Andrew Lowe Watson (not verified) on Sat, 07/15/2006 - 11:02am. 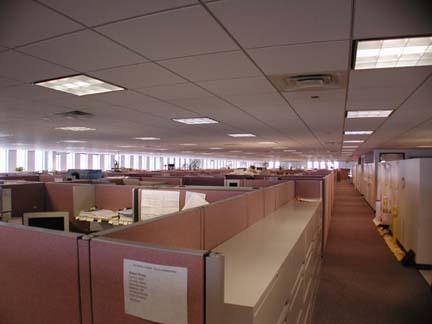 There's something obvious nobody ever talks about - the WTC had the standard office- style roofing panels. On every floor, you could just lift up the lightweight panels and slide in the bomb, nice and snug next to the support columns. The odds of anyone poking around in there on Sept. 10th were pretty slim, so it was pretty guaranteed nobody would find them during the 2 - 3 days that they were planted within the building. The photos/videos of squibs and fire damage also seem to indicate this is where the bombs were placed. Luke (not verified) on Sat, 07/15/2006 - 11:18am. Andrew: I am not closed to any theories. But I think we should run with the ones that have overwhelming evidence. GeorgeWashington (not verified) on Sat, 07/15/2006 - 11:18am. Luke, is that a photo inside the Twin Towers? GeorgeWashington (not verified) on Sat, 07/15/2006 - 11:19am. Chris, if you out there you did it Bradblog is discussing an open thread idea for 911 among other things. Pat on the back buddy. Doug (not verified) on Sat, 07/15/2006 - 11:20am. Monsieur le Prof (not verified) on Sat, 07/15/2006 - 11:29am. What were the 3 companies who insured the WTC? AIG, MMC and ACE. All run by Greenbergs at the time. They then sold stakes of the original contract to their competition, a process called reinsuring. Once the towers came down, the reinsurers got caught holding the bag. Note: Who mortgaged the WTC? The Blackstone Group, headed by Peter J. Peterson, current head of the CFR. The Blackstone Group bought into Kroll in 93 at the same time as AIG took majority control. Henry Kissenger sits on the board of the Blackstone Group. DHS (not verified) on Sat, 07/15/2006 - 11:34am. Luke (not verified) on Sat, 07/15/2006 - 12:17pm. u2r2h (not verified) on Sat, 07/15/2006 - 12:45pm. Ann (not verified) on Sat, 07/15/2006 - 12:54pm. Oh yeah, camera phones weren't even around on 9/11. Ha. Ann (not verified) on Sat, 07/15/2006 - 12:57pm. The tactical nukes theory- which surfaces periodically- seems of the same nature as the "directed energy weapon" explanation. They are both outlandish. Even though I think both theories have been offered sometimes by sincere people (but more often by insincere ones) - they are far more fantastic and far more implausible than the traditional demolition theory. I think they end up trying to steer the collapse of the buildings away from the conventional (thermite/thermate) and into the wildly speculative- and as a result, they provoke incredulity and skepticism. I had a spirited discussion only a couple of weeks ago with a very good friend of mine- a fellow I've known for fifteen years. He is a conservative Republican (which I was, until about two years ago, when the scales started to fall from my eyes). We've argued about 9/11 repeatedly- for months- frequently to the amusement of those around us (we work together). When I recently mentioned to him in the course of a debate that evidence of thermate had been found on steel from the WTC- by a conservative scientist who voted for Bush no less- I could tell he was genuinely stunned, and at first offered joking dismissals of the trustworthiness of the findings. But I labored further, and told him the evidence was being peer-reviewed by disinterested parties- without repudiation by any. And furthermore, that secondary evidence from a difference source of WTC steel was also being examined. And even furthermore- that FEMA had found similarly suggestive evidence- yet they refused to draw the damning conclusion. It shut the conversation down completely. Had I talked about tactical nukes or directed energy beams, he would've quickly asked whether aliens were involved, or if I had considered the possibility that maybe the Wave Motion Gun had been employed in the destruction of the towers. And witnesses would have laughed and given him the upper hand in the debate. I apologize for the long anecdote- but I offer it because I think it is illustrative of how important it is to stick to that which is the most damning and the most provable. I hate to keep harping on this, but if a 9/11 explanation seems inherently fantastic (holograms, nukes, blue-screens, missles hitting the Pentgon, etc.) - we should avoid mentioning it. We're trying to confront people with a very, very difficult-to-believe possibility. We must recognize the difficulty in making the cognitive leap and avoid invoking subjects that can actually further close the very minds we're trying to open. disinfo agent (not verified) on Sat, 07/15/2006 - 1:21pm. I have to say I find the Scott Forbes interview to be insufficient evidence to prove there were power downs before 9/11. No one else has made this claim. Andy White (not verified) on Sat, 07/15/2006 - 1:40pm. I also want to add that our government trains special forces such as SEALS, CAG(formerly Delta Force), and I'm sure other units how to use explosives such as thermite. So if we know that people are trained to covert demolition something if necessary, we know its possible someone could have done it at the WTC. Plus many special forces out of service work for private security contractors such as BlackWater. Their basically mercenaries, maybe if it wasn't someone in the service it was some of the security contractors. They could have been paid enough to do the job and stay quiet. Andy White (not verified) on Sat, 07/15/2006 - 1:44pm. I don't see any problem in how the towers could have been loaded with thermite/thermate, other incendiaries, & conventional explosives. Just one example: Agents could easily have been undercover as maintenance men, repair crews, general contractors, building inspectors, etc., with uniforms, ID badges, whatever. They could have been doing months-long jobs on air conditioner/heating ducts, electrical conduits, bathroom/sprinker plumbing lines, ceiling or floor panel replacements, painting/plastering, or you-name-it. Who would be watching such workers ever minute? They could have even worked nights & weekends when fewer people would be around. Visitor on Sat, 07/15/2006 - 1:54pm. By agents^, I mean U.S. Visitor on Sat, 07/15/2006 - 1:58pm. Of course it could've been planned for years??? After the 93 attack even. No one knows. That's why we're all so pissed is because of so many things we don't know still, and are ignored. DHS (not verified) on Sat, 07/15/2006 - 2:33pm. One man's flight of fancy is another man's truth. We worry too much about what people will say. If it's the truth it's the truth. Do I detect the faint signs of denial even among truthers of something too shocking to accept? Still, we shall see what comes out. Andrew Lowe Watson (not verified) on Sat, 07/15/2006 - 2:47pm. I started writing a new song idea. Andrew Lowe Watson (not verified) on Sat, 07/15/2006 - 2:49pm. james ha (not verified) on Sat, 07/15/2006 - 2:57pm. Monsieur le Prof, that's funny stuff! Hats off to you... or should I say chapeaux? Merci... c'est si bon! Mssr. Jouet (Magmak1) (not verified) on Sat, 07/15/2006 - 4:00pm. William Rodriguez stated that building power downs were a regular occurrence. He also said the building engineer (name?) was best person to ask about this, but was killed in the collapse. I have read elsewhere that powerdowns were extraordinary due to all the computers in the building that would require off-site redundancy. Steven Jones said that explosives could be planted in elevator shafts, since interior of shaft would be open and accessible to demolition team riding on top of elevators. Remember, they've been described as "cutter charges". I also asked him at LA convention why the building didn't explode immediately upon impact by the planes. He said that thermate/thermite is very stable even at kerosene burn (jet fuel) temperatures. He described colors, bright orange, versus white hot. Thermite is ignited by white hot magnesium ribbon which is ignited by flame. Therefore, magnesium ribbon had to protected from flames from plane impacts. if you are a no-planer, like me, explosives would be placed on the exterior of the building to cause the implosive impact inward in the shape of the plane. In that zone of the building, thermite charges would be excluded to prevent triggering of premature collapse. we don't know the ultimate plan for the demolition. Was the plane impact expected to start the chain reaction? Did the plan fail due to snafus in the demolition sequence? Did the planners wait to allow some number of people time to evacuate? For me this is worth looking into. I think we should assume that things didn't go as smoothly as planed. Afterall, this was an extraordinary, never-been-done demolition of two hundred-story buildings. TS Gordon has stated in his affidavit (see link above) that structural flaws due to galvanic corrosion at exterior walls compromised the integrity of the buildings. He also states that a team of engineers was assembled by FBI/CIA agents could have supplied detailed research as well as drawings to locate placement of charges. (please read TS Gordon's article....very interesting). Same team would have designed the sequence and would likely have designed the igniter and control system. Has anyone thought about how the igniter was designed? Radio controlled? or hardwired? 911witness hoboken recorded and graphed the explosions. his upwind cameras also recorded white light flashes from roving helicopters. he also described the sound levels from the two buildings. one of the towers used a lot more explosives than the other as shown by seismic readings. Don't pools of molten metal indicate small thermo-nuclear explosions? Nuggets (not verified) on Sat, 07/15/2006 - 4:12pm. I have another theory about the demolition team. They went back to melt and disappear into the Mossad. They were the patsy Arabs that were hired and trained by the CIA, told to place the bombs (to get back at the evil Americans) and then later told to board the shot-down plane that ended up in Shanksville debris field. Since we don't know the identity of any of the demolition crew, they could have been easily "offed" and placed in some non-descript mass grave. Nuggets (not verified) on Sat, 07/15/2006 - 4:22pm. If the WTC collapsed in 14 seconds, then they fell at the same speed as the Trojan nuclear reactor (500 ft tall, collapsed in 6 seconds). This was a solid concrete cooling tower with no central support columns whatsoever. Anonymous (not verified) on Sat, 07/15/2006 - 4:34pm. Eric B (not verified) on Sat, 07/15/2006 - 5:43pm. Robbie, can you come over? No Mary, I have to dew my homwork. TS Gordon (not verified) on Sat, 07/15/2006 - 7:22pm. "and we know that tactical nuclear devices exist which could fit in a suitcase - planted in the basement of each tower be enough?" Then why did WTC 1 and 2 collapse from the top down? Thgis "essay" presents absolutely no evidence whatsoever of bombs being planted. When are you people actually going to learn that? S. King (not verified) on Sat, 07/15/2006 - 8:19pm. Chris (not verified) on Sat, 07/15/2006 - 11:33pm. Chris (not verified) on Sat, 07/15/2006 - 11:35pm. S. King, why spend so much time here then? You're obviously fighting a losing battle. dylan (not verified) on Sat, 07/15/2006 - 11:43pm. I don't know, but thermite can certainly raise metal to molten temperatures. Visitor on Sun, 07/16/2006 - 12:21am. Interesting question.Since seismic records show evidence of a blast a full nine seconds before the start of the collapse, something must have delayed the explosive energy from demolishing the lower floors as it powered up the elevator shafts. I'll admit I am no more , or less qualified than you to speculate on these matters.The difference is that I want to know the truth. You are content to take the word of a discredited government-sponsored report. Good day. Andrew Lowe Watson (not verified) on Sun, 07/16/2006 - 3:09am. Also, there are ways to make implosions start top-down or middle-down. Visitor on Sun, 07/16/2006 - 4:54am. u2r2h (not verified) on Sun, 07/16/2006 - 5:28am. Andy White (not verified) on Mon, 07/17/2006 - 3:29pm. I have felt for sometime that we would come to a point where there was no way the neocons could run from the acqusations coming at them. I've known that every faction of the DC Mob has learned some profound personal lesson(s) about going against the system. That Hillary and Bill were so up to their eyeballs in 'gimmies' that they would cower like lambs to the banking elite. And Alex Jones has never missed a beat! At least I've known the Clinton's from inside, and I learned early not to "trust" either one. My motto, moving forward is: "Heil Hillary!" I figure you may as well start a rich-n-deep slander campaign EARLY, you can't wait until they have pronounced a sleepy little town like Haifa, (or Little Rock) to be the heart of the al-Quaeda "training-ground." Bill, after they whacked Vince, (dad's friend) I can understand your "wanting to die for Israel," but I'm going to do you one better and make sure you are remembered for MENA. 1.1Million in Mexico City, just in case someone was counting. Someone mentioned pots and pans in DC. Attacking the Media at their center, and forcefully!- This starts TODAY, for all of you inclined to pay the rental on some bull-horns. Even one lone voice urging them to "End the B.S.!" -will help stoke the public into immediate action. But, the fact is plain as day. We need the UNIONS, and we need the Mob. We need trucks jack-knifed on the DC turnpikes, and people willing to park their cars mid-traffic. We need somebody to cross the electric grid with the phone systems as well. That's how bad it really is. And, I've long since given up completely. No amount of shrill grandstanding, no dynamic poster campaigns, no more grafitti, none of that will work. All I can do is leave for a remote part of the world and await the coming sorrow. After his meeting with Bush, Putin says America has something much worse than Aids! TS Gordon (not verified) on Mon, 07/17/2006 - 7:39pm. Sorry, that was the weirdest thing I ever wrote! I meant to give it a 'title;' "How could they plant the Bombs?" - Yes, How COULD they??? The fact is that Bill Clinton would tell us everything if he were subjected to a brain-scan. TS Gordon (not verified) on Mon, 07/17/2006 - 7:49pm.